Claudia began her clarinet studies at the age of 9 with her father and later in `Ángel Barrios´ Conservatory in Granada. In 2012 she finished her studies with professor Jesús Estudillo and she is accepted to study her clarinet bachelor in Musikene (Higher School of Music of the Basque Country) with the professors José Luis Estellés, Anthony Pay, Sergio Barranco and Henri Bok. 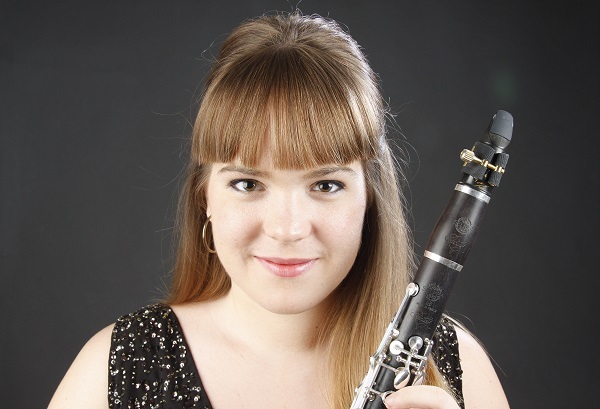 In June 2016 she was accepted to attend the Master in Clarinet Performance in the Sibelius Academy (University of the Arts of Helsinki), with the professor Harri Mäki. During her trajectory, she has received advices and masterclass by Carlos Gil (OCG), Justo Sanz, Wenzel Fuchs (Berliner Philharmoniker), Sharon Kam (Hannover), Martin Fröst (Sweden), Hedwig Swimbergue (Belgium) and Radovan Cavallin (Gran Canaria Philarmonic Orchestra), among others. Claudia has been awarded as a soloist and as a part of chamber music groups in Nacional and International Competition: Reicha International Competition in ISA13 Festival in Viena (Wind Quintet), European Clarinet Competiton 2011 in Madrid, II Clarinet National Competition in Madrid 2009. In 2015 she won the Second Prize in the Concurso Permanente para Jóvenes Intérpretes of Jeneusse Musicales of Spain. In her career Claudia has taken part of: Symphonic Orchestra of Bilbao (BOS), Andalucía Youth orchestra (OJA), Granada City Orchestra (OCG), Granada Philharmonia Orchestra, Granada University Orchestra, among others. In the chamber music area has taken part of Stretto Trio ( clarinet, cello and piano) and Haizea Ensemble (Wind Quintet), with this last one participating in the Quincena Musical Festival 2016 in San Sebastián (Spain). You can listen to Claudia here. If you are interested in working with Claudia, please get in touch with the EMCY Office.